I'm not going to do a complete review of the products I've been using for at least a couple of months, but I will highlight why I will continue to re-purchase. Living Proof Night Cap - This is an overnight hair mask that I use once per week and then rinse out in the morning. It imparts tons of softness and shine. This is just a large sample that I received as a Sephora perk, but I'm buying the full size once this is gone. Hey, we use masks to moisturize our skin, why not do the same for our hair? Genius. Aveda Phomollient - I've tried many volumizers at the roots of my hair to add some lift, but most weighed down my fine hair. This is great because it's more of a liquid instead of a mousse. I pump some out into my hands and apply directly into my roots and onto my scalp, concentrating on the crown of my head. Matrix Biolage Anti-Static Spray - I attract static like a balloon, especially when the weather is dry and windy. This is the only product I've found that really combats and prevents my hair from standing on end. Or, looking like I stuck my finger in a light socket! It's a God-send. Aveda Dry Shampoo - I'm not a huge fan of dry shampoo. I usually wash my hair every third day, or three times per week. In between, I just let it do its thing. I was using a spray dry shampoo, but it didn't quite absorb all the extra oils. This is very similar to baby powder. It does leave a white residue, but if you rub it into your roots like crazy, I assure you it will disappear. I love the herbal scent as well. It's refreshing and very clean, and if you're familiar with Aveda then you know what I'm referring to. Also, a little goes a long way, so I feel like this product is giving me my money's worth. I hope you enjoyed this hair product update. Otherwise, I'm using the same products I've already written about. If you have any must-haves that I need to try, please let me know! I love experimenting. It sounds like we have very different hair types, but I'm so surprised to hear you have fine hair! I've always thought it was very thick! It always looks so shiny and pretty. I need all the volumizing I can get so the Aveda Phomollient sounds like a good one for me to try! 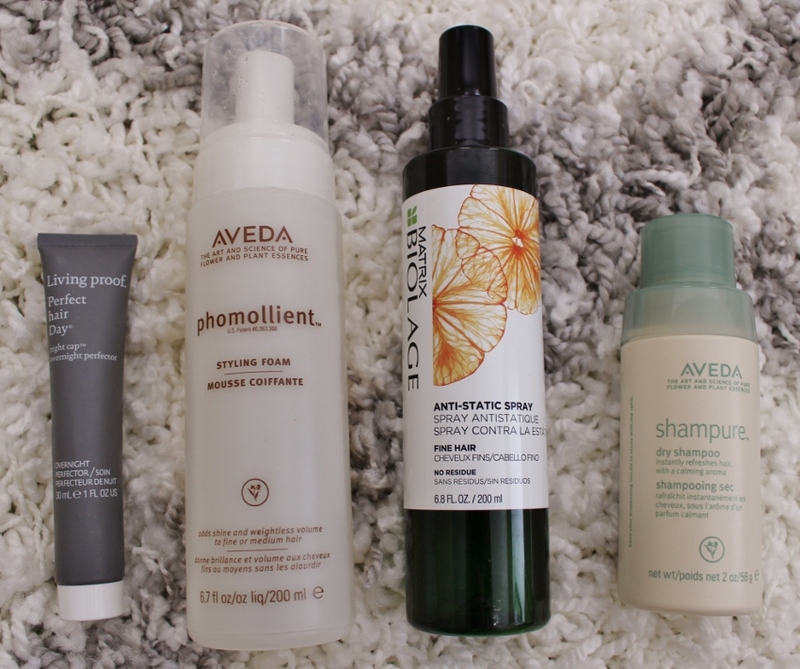 I would love to try the Aevda Dry Shampoo! Thanks for sharing this!